With the rapid increase in available bacterial whole-genome information, comparison of bacteria at the whole-genome level has proven to be highly useful in microbial phylogenetic research. Here we constructed a phylogenetic tree based on 15 whole genomes of Mycoplasma and the related bacteria. First, 143 orthologous gene families that are shared by all of the 15 bacteria were selected and 143 multiple alignments were generated. Next, a concatenated multiple alignment inferred from the 143 multiple alignments was generated. A total of 43,370 amino acid sites were considered in the neighbor-joining analysis. The phylogenetic tree based on the whole-genomic information indicated that the 15 bacteria were divided into four major groups with 100% bootstrap support, i.e., the M. hyopneumoniae (Mhy) group, the M. mycoides (Mmy) group, the M. pneumoniae (Mpn) group, and the Bacillus-Phytoplasma (BP) group. In the phylogenetic tree, the Mhy group was more closely related to the Mpn group than the Mmy group. The relationships among the Mhy, Mmy, Mpn, and BP groups were supported with 100% in bootstrap analysis. The phylogenetic tree based on the whole-genome comparison is different from the 16S rRNA tree. Thirty-nine of the 143 phylogenetic trees had the same type of the topology based on the whole-genome comparison. However, we could not identify a gene family contributing or solely belonging to the topology of the 39 proteins. In this study, we showed that some proteins, such as RpoA, RpoB, RpoC, and RpoD, are not suitable for evolutionary studies on relationships among major groups of mycoplasmas. We also showed that glycolysis-related genes of Ureaplasma have a higher substitution rate than the other bacteria. The phylogenetic approaches at the whole-genome level are very important and will be essential for microbial evolutionary studies. The online version of this article (doi: 10.1007/s00239-007-9010-3) contains supplementary material, which is available to authorized users. 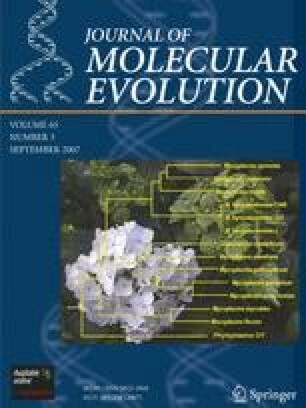 The authors thank Haruo Yamamoto for helpful advice in constructing phylogenetic trees and two anonymous reviewers for their valuable comments. The Agricultural Bioinformatics Research Unit is funded by the Japan Science and Technology Agency (JST).